Take a look at the photo above. 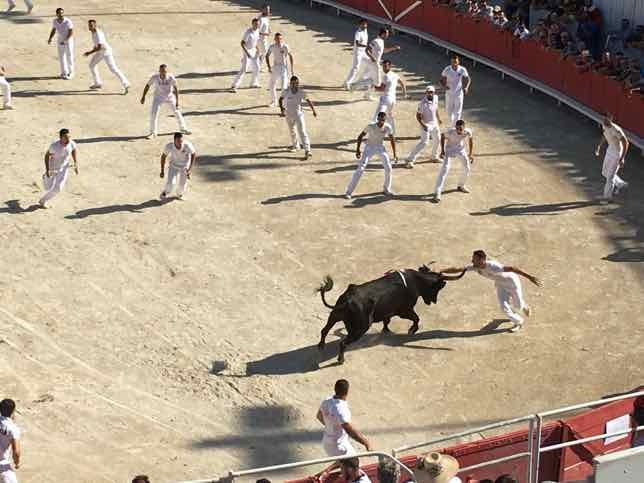 Would YOU really want to visit this place? 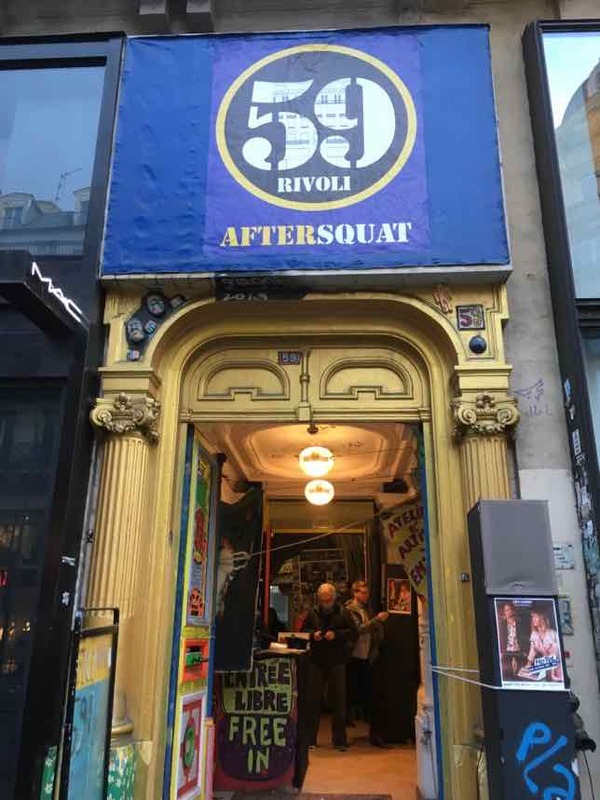 I was NOT impressed and expected so much more when I recently made the trek to the 20th arrondissement in eastern Paris (Trip #30). 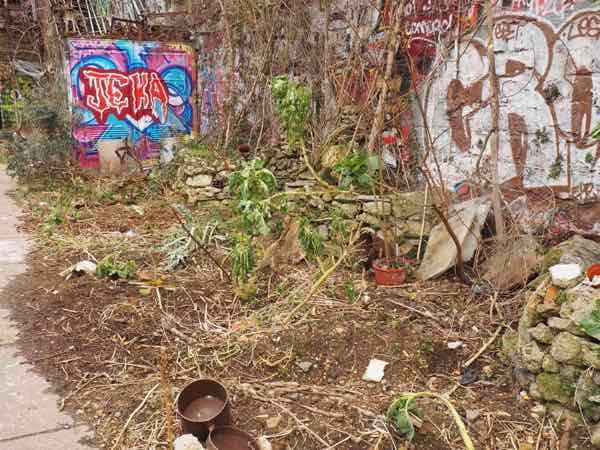 So many websites (including the Paris tourism board) were touting this interesting place as an oasis of greenery and nature. So I thought, ”Gee, I better check this out. 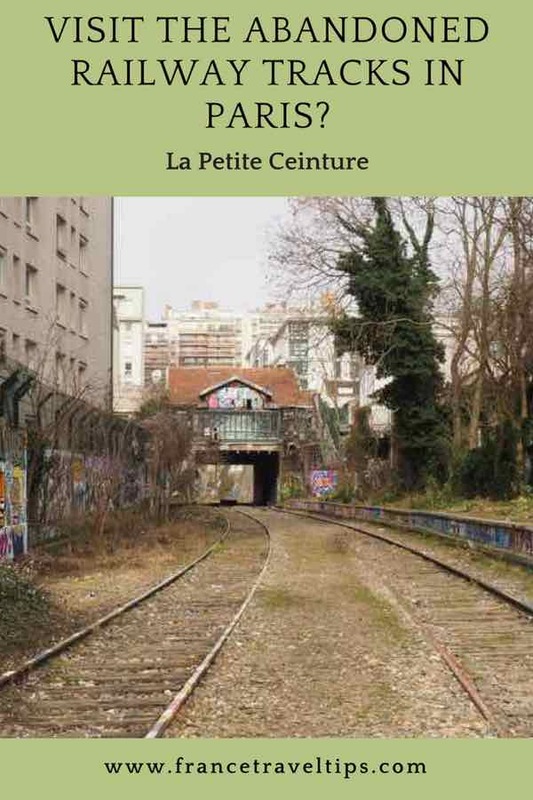 Sounds like a really unique place to write about.” Unfortunately, when I got to La Petite Ceinture, I felt like I’d wasted my time. While I’ve written this post so you won’t waste your time, this only applies to the entrance that I found. 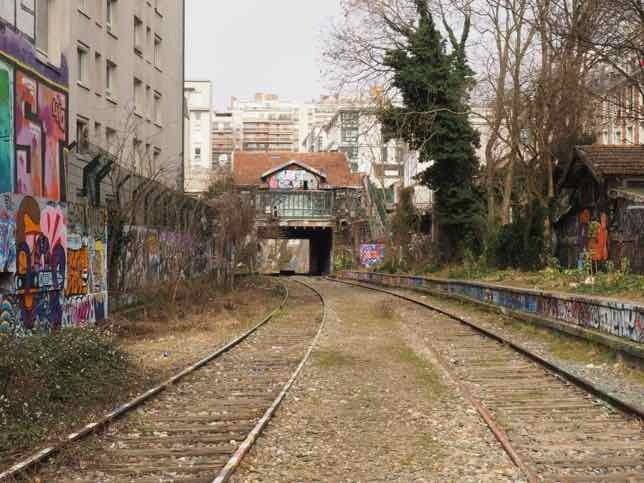 There is a “chance” other sections of La Petite Ceinture might be nicer. The search for better areas will have to come another time. Paris used to have a railway that encircled the city. It was originally called, Chemin de fer de Petite Ceinture and is now known as La Petite Ceinture. “Ceinture” means belt and this railway was like a belt, as it formed a ring around Paris. It was initially constructed beginning in the 1860s to provide troops and provisions to the armies who manned the walls of Paris. The Petite Ceinture also connected the train stations located throughout the city and it was in operation until 1934. At that time, Paris had expanded beyond the railway line and the current Périphérique highway that now encircles Paris was constructed. There was no longer any need for this railway line. The City of Paris and the SNCF train company joined forces to open up the rail line to communities to create nature walkways and parks. In sections local residents have created gardens. 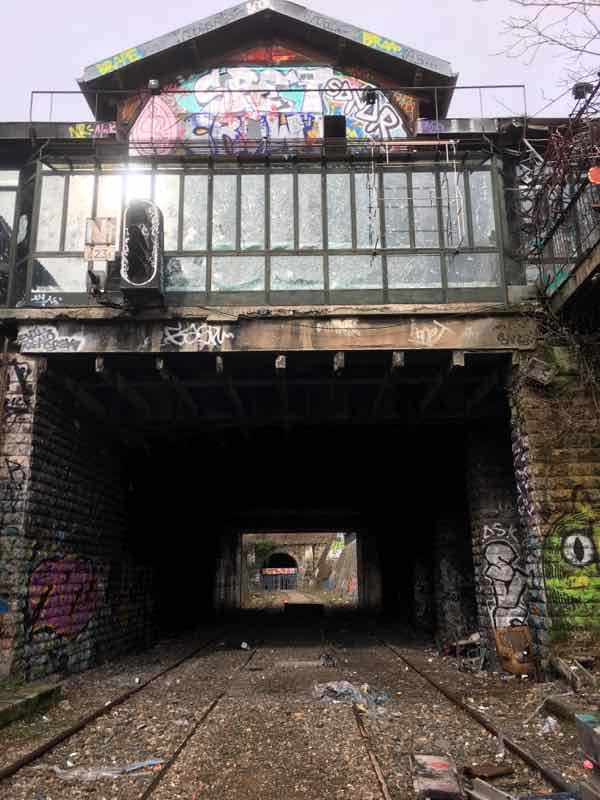 There are many different entry points where you can see the abandoned railway in Paris and I went to the one most written about. Location Of La Petite Ceinture In The 20th Arr. I should have known all would not be well when I saw the entrance. 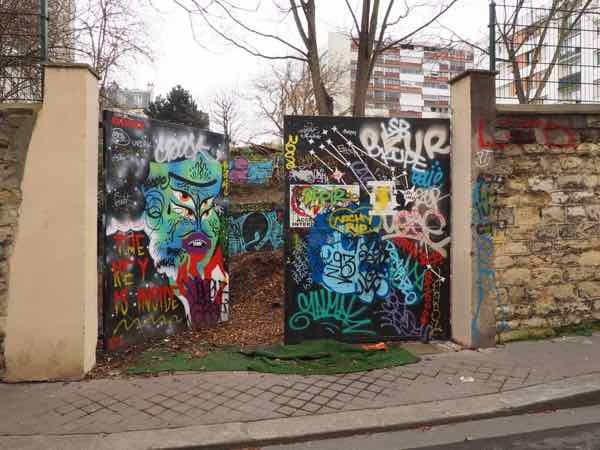 The open gate was covered with graffiti and once inside, the ground was littered with garbage and the walls were also covered in graffiti. The wobbly stone steps that I climbed brought me to the upper side of the tracks. 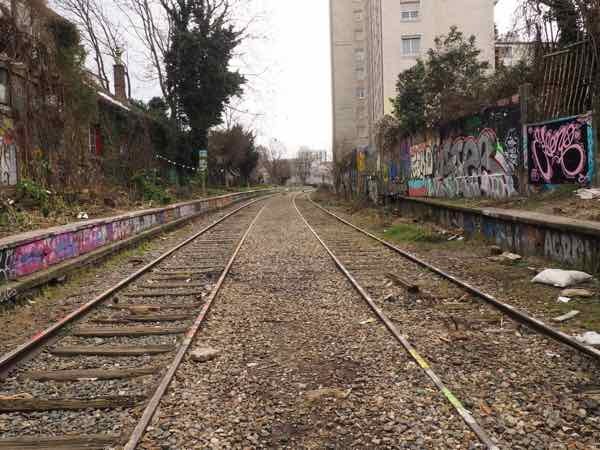 From there, I hopped down to track level and began to explore the Petite Ceinture. But I didn’t go far. In the distance one way, I could see more tracks that were covered with grass. On either side were stone walls covered in more graffiti. In the other direction was a tunnel. If you’re very adventurous and you have a flashlight you might want to explore these old railway tunnels. But be warned—-there are rats! Maybe it was the time of year (early March) or maybe there are better parts of the Petite Ceinture to see; however, I was expecting to see more “green” and less graffiti. More nature and less trash. In my research some people even suggested bringing a picnic. No way! I’m not sure if I’ll venture out again to try another section of the Petite Ceinture and see mother nature. 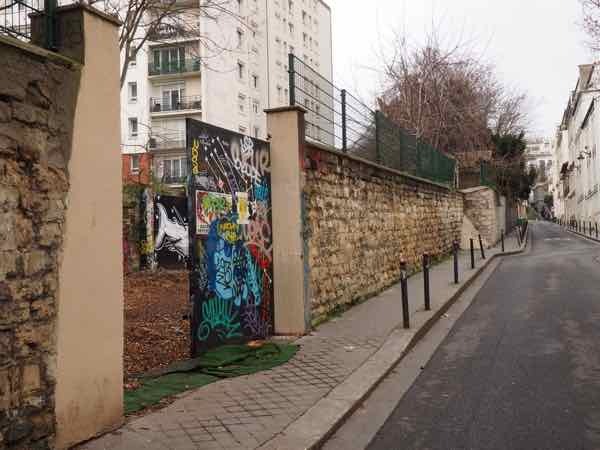 Supposedly there are entry points in 9 arrondissements (12th-20th arr.) Bonne chance if you do go and if you have already discovered an idyllic spot in La Petite Ceinture, please let me know! 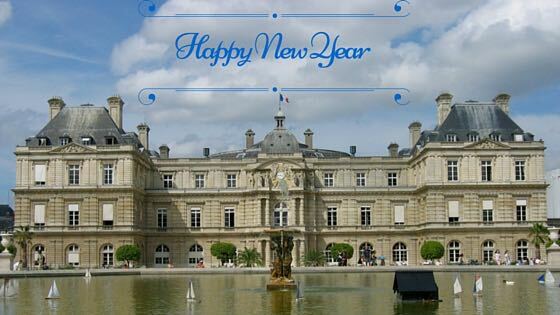 Walk south, and just past Rue Galleron is the gated entrance on your right—around 5 Rue Florian. It sounds like this is a “best kept secret” that should remain a secret!